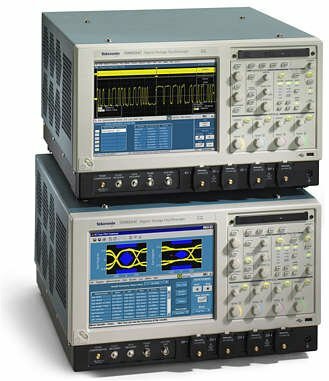 The Tektronix TDS6154C digital storage oscilloscope is a versatile test set specifically designed for variety of useful applications in system design, compliance testing, and system debugging. It is a cost effective solution for challenging testing situations involving datacom, next-generation computer, and communications equipment. The deep memory, high sample rate, and high bandwidth also make the TDS6154CA a excellent option for data acquisition uses. The digital storage oscilloscope incorporates MyScope Custom-control Windows. The feature enhances users’ productivity and enables them to accomplish more in less time. Its right-mouse-click menus provide the operator with exceptional efficiency during measurements. In addition, the digital storage oscilloscope allows the technician to easily achieve pinpoint, high performance triggering. This feature offers more than 1400 combinations to enable users to address any triggering situation. The Tektronix TDS6154C also allows for serial pattern triggering of up to 3.125 Gb/s and serial data analysis rates of 6.25 Gb/s, achieving these high serial data analysis rates with quick precision. The TDS6154C utilizes the Microsoft Windows operating system together with OpenChoice Software to offer built-in networking. This combination is also used for built-in analysis purposes. The test set utilizes technology-specific Software Solutions to provide operators with domain expertise for jitter, serial data, USB 2.0, communications, DVI, and power measurements, and features a 2.8 GHz Dual-processor System. Learn more about OpenChoice here. The embedded high-resolution XGA display is designed to enhance the readability of measurements in different light settings. Other impressive TDS6154C features include front-panel CD-R/W, 1000 BaseT network connection, and front-panel USB 2.0 Port. Capable of working with a broad range of applications, The TDS6154C is specifically optimized for signal integrity, timing, and jitter analysis. The unit is ideal for debugging, characterization, validation and compliance testing of digital designs. Apart from applications involving storage-area network designs, datacom, computer, and high-speed backplanes applications, the TDS6154C is also ideal for data acquisition and high-energy physics measurements. Intelligent design also assists technicians with their measurement and analysis exercises without sacrificing record length, bandwidth, or sample rate. Users will appreciate an excellent combination of record length, bandwidth, and sample rate. Another important feature of the TDS6154C is the Tektronix-proprietary DSP enhancement that assists with high-speed channel-channel measurements. Learn more about Digital signal processing (DSP) Here. This TDS6154C oscilloscope offers four convenient input channels, a bandwidth of 15 GHz and a true analog bandwidth of 12 GHz. In addition, it provides an input impedance of 50 Ω ±2% and a vertical resolution of 8 bit. Moreover, the TDS6154C is designed to deliver a DC gain accuracy of ±2% and a position range of ±5 divisions. Development support including C, C++, .NET, MATLAB, Visual BASIC, LabWindows/CVI, and LabVIEW environments. Up to 50 specific parametric measurements in the statistical domain, time and amplitude. This entry was posted in Site News and tagged Tektronix TDS6154C. Bookmark the permalink.